The publication and citation records of a group of 34 senior members of the faculty of the Department of Chemistry at Technion-Israel Institute of Technology over the period 1980–90 have been analyzed under the contention that dealing with a small group makes it possible for one to pay adequate attention to the methodology of the measurement and analysis processes. Choosing the most suitable index for measuring “Publications Output” has been considered in detail; it is suggested that it is essential to make allowances for both the number of co-authors and for the lengths of publications in order to obtain a more valid measure than is provided by a simple count of equally-weighted publications. 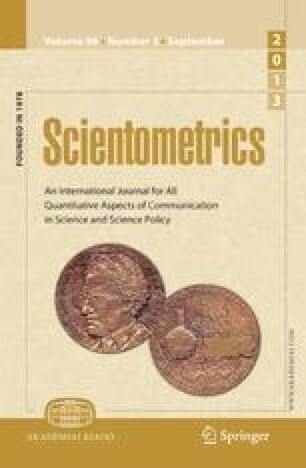 Analogously it is argued that simple citation counts provide an inadequate measure of the impact that publications make on the group outside the authors' immediate circle and thus that it is necessary to subtract self citations and divide the credit for a citation among the co-authors of the publication. Results of the analysis show that in agreement with all previous findings a few members (perhaps less than 20%) produce more than half the publications and receive more than half the citations of the Group as a whole.